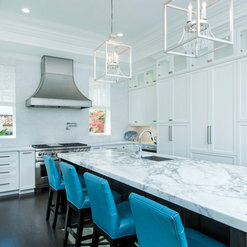 We can accommodate any budget, there's no project thats beyond our expertise! I hired HD 2020 to install a Control 4 Home Automation system including wireless thermostats, and door locks. They proposed an additional wireless router and hub, which I agreed would be beneficial. I also had them install com cable to various other parts of the house for future expansion. The project also included outdoor speakers with a SONOS system that was also capable of expansion. I utilized an existing TV, surround sound system, and DVD receiver. They informed me that they would have to write some drivers for this which I also agreed upon. The installation went OK, however getting the system to function correctly has been and continues to be a nightmare. It took 3 technicians and 4 trips to get the thermostats to function correctly. I received very limited documentation on all of the equipment that was installed so I could do no troubleshooting on my own. They installed a Surge arrester/power supply for the main equipment but it is undersized. Whenever we lose power in Florida for just a moment (which is often) the surge arrester trips its internal circuit breaker and starts beeping and will not turn back on. I have to unplug everything, turn it back on, and then plug everything in one at a time. HD 2020 will not resolve this issue. I asked for a connection list so I knew what was connected where and I never received anything. There must be 10 CAT 5 cables going from my TV to my DVD receiver and I have no idea what is connected where. The salesman promised me to come and visit after we had the system and answer any questions and resolve any issues, this has never happened. There are several issues with the programming of my remote but they did not give me any software to modify anything. I sent them a list of issues I needed addressed, they showed up while I was not there and did not fix anything. I would like to fix some of the programming but I don't have the software to do it. Bottom line is that I spent $10,000 for a system with no flexibility and more problems with the remote that I had after spending $250.00 on a Harmony remote and could make changes myself and I never had to use another remote. Now I do almost every time I use the system. This is an update to my original post. HD2020 has responded to the issues I have had with the system they have installed. So far all of the issues have been resolved and I am having no current problems with the system. Chris was friendly and professional. He is an A/V enthusiast for sure, and will offer you the best equipment. 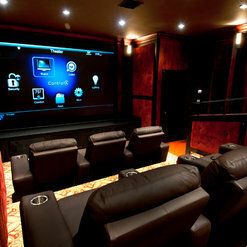 However, when the best is invariably over budget, he works with you to tailor the home theater to your desires and budget. Please note, I am a repeat customer. Chris and his team did an excellent job helping me when another company was not able to correctly do the work requested. 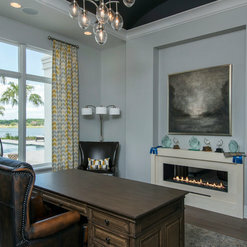 They did work at my home and office and I recommned them for him estimation and Audio-visual in the Tampa Bay Area. I have been very pleased with the professionalism and competence of the HD2020 team that serviced my family's home entertainment needs. They were able to create my vision at a good value! HD2020 did an amazing job on our home. 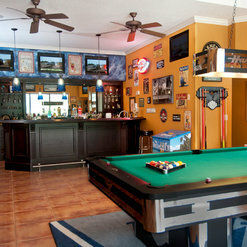 They handled our security, audio/visual, theater room, kids' game room, and all around automation of our home. I cannot say enough about the level of attention we were given by the members of the HD2020 team. They remain available to this day if we have any issues/concerns. Chris Wilt helped us design a system that was just what we needed. He never tried to up-sell us. He got to know us and our lifestyle, in order to customize a plan that fit our family and worked with our vision. Everything is beyond our expectations. We are VERY picky, and don't like clutter. 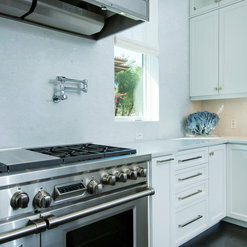 The clean lines of our home were never disrupted by the electronics.......they blend in perfectly. 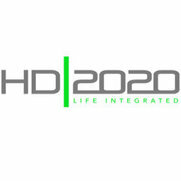 I would recommend HD2020 to anyone, and I have already referred many people to them. This home is our "dream home" - and the dream became a reality with the help of HD2020. We had HD2020 do our entire new home construction with smart home technology. 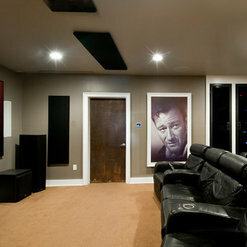 We also had them do an amazing home theater system Finnishing up with the home alarm system. The staff were great to deal with, they treated us with respect and took the time to explain every facet of the process. Chris was very in tuned with our needs and wants, he made several suggestions during the process to improve on our ideas and stay on budget, It turned out amazing, we couldn't be happier. We had a great experience and would highly recommend HD2020 to anyone wanting the best of the industry. This is a terrific company. We hired them to install a whole house system to control lights, audio, temperature, door locks, television. They had a great team of people, each one specializing in a different area. 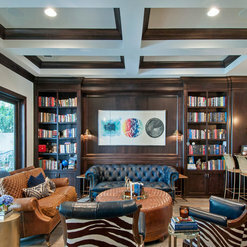 They installed this system over 4 months and were minimally invasive in the process of pulling hundreds of wires through the house, placing them in the ceiling, finding the right connections. We now operate music, tv, door bell, temperature, lights and different lighting scenes through an Ipad. Enclosed is a picture of the cart which is installed in a closet which operates all the different systems in the house. Fabulous system, not inexpensive but they stayed close to budget and we only went over by less than 10% for things we wanted to add. Very low pressure but high service. Can't recommend them more if in the market for a high end electronic control system. Commented: Is there a price available on this wall unit?This was custom built by an cabinetry company.